This is a collection of texts from the Tsimshian, who lived (and continue to reside) on the northwestern coast of British Columbia. 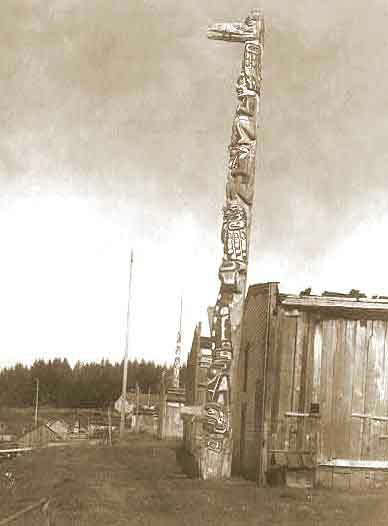 An earlier (1902) collection of Tsimshian Texts by Boas, is also available at sacred-texts. The first three are tales of culture heroes and heroines, far longer than most texts of this kind. These first three stories, with legendary quests, mysterious supernatural beings and atmospheric descriptions, remind one of Icelandic sagas. Following these are a couple of short and fairly unremarkable animal rivalry stories. The last item is a notable deluge myth which appears to have very little if any European influence. Boas' Tsimshian translations have been criticized recently, as has his relationship with his informants as employer. There is no reason to believe, however, that these texts are not authentic. Boas was a primary figure in the dawn of modern anthropology, and the operating procedures and theory of ethnography were still being worked out at the time. 1. The Story of Asdi-wâ'l; or, The Meeting on the Ice.